Assam Urban Infrastructure Investment Program. 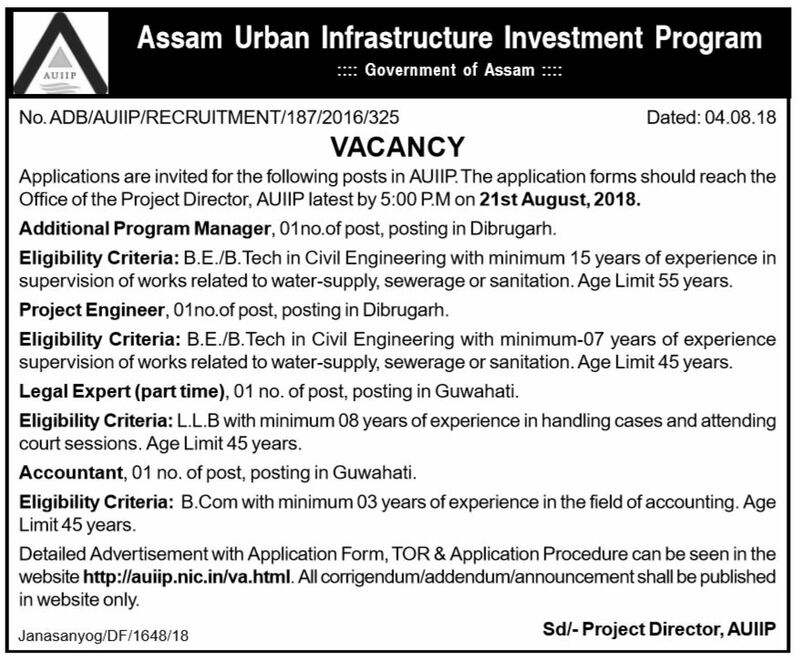 Applications are invited for the following posts in Assam Urban Infrastructure Investment Program (AUIIP). The application forms should reach the Office of the Project Director, AUIIP latest by 5:00 PM on 21st August, 2018. Educational Qualification: B.E./B.Tech in Civil Engineering with minimum 15 years of experience in supervision of works related to water-supply, sewerage or sanitation. Place of posting: Dibrugarh. Educational Qualification: B.E./B.Tech in Civil Engineering with minimum-07 years of experience supervision of works related to water-supply, sewerage or sanitation. Place of posting: Guwahati. Educational Qualification: L.L.B with minimum 08 years of experience in handling cases and attending court sessions. Place of posting: Guwahati. Educational Qualification: B.Com with minimum 03 years of experience in the field of accounting. How to apply: The application forms should reach the Office of the Project Director, AUIIP latest by 5:00 PM on 21st August, 2018. Detailed Advertisement with Application Form, TOR & Application Procedure can be seen in the website http://auiip.nic.in/va.html. All corrigendum/addendum/announcement shall be published in website only.